There are many plenty of reasons to see "The Crude and the Rare," the new natural resource-themed show, curated by Saskia Bos and Steven Lam, at Cooper Union. It is, for instance, a perfect excuse to explore its new building, designed by Thom Mayne and Gruzen Samton. 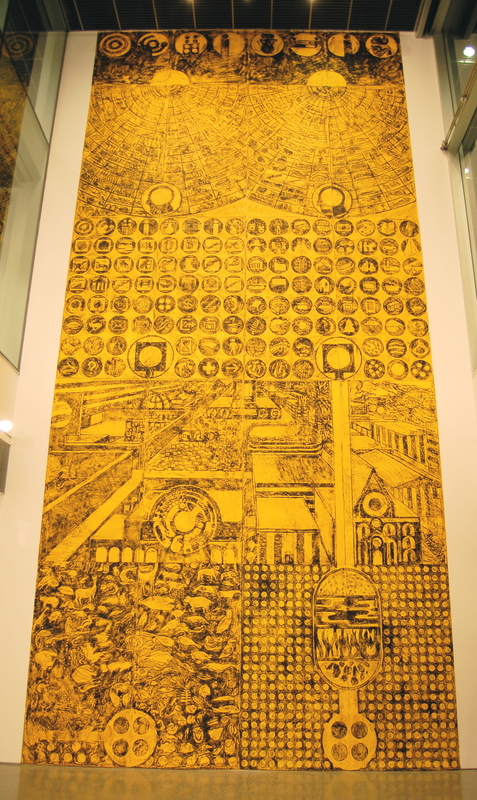 It has, in addition, rarely seen pieces by Marina Abramovic, Alfredo Jaar, and Lawrence Weiner, and a towering, two-story-tall drawing by Matt Mullican. But it also has a sculpture by the reclusive and wonderful Robert Kinmont, who produced a handful of the most fascinating ephemeral pieces of the 1960s and 1970s — handstands on mountaintops, photographs of dirt roads — and then stopped making art for 30 years. 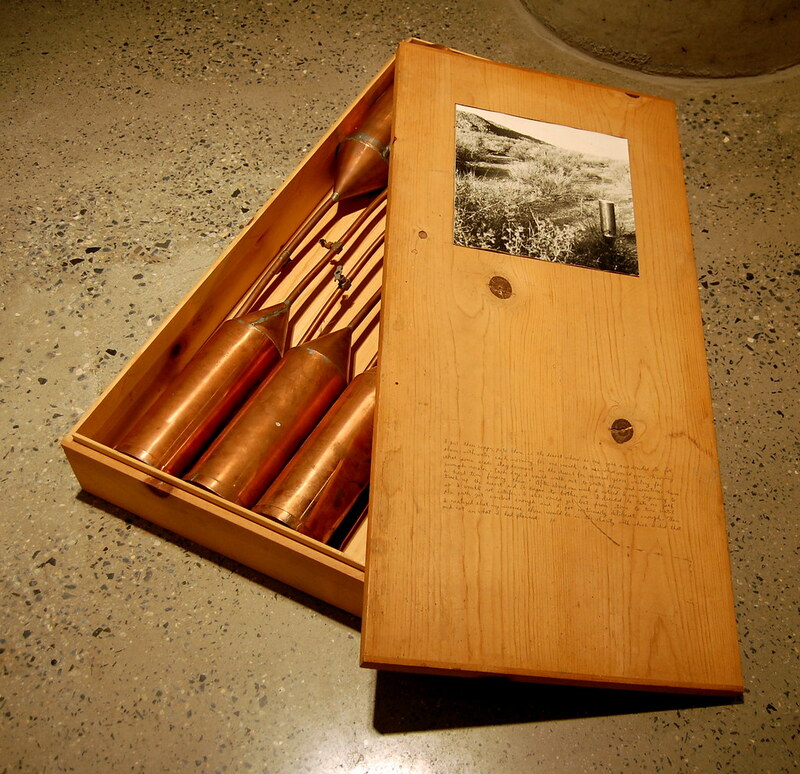 "I put these copper pots there in the desert where no one goes and decided to fill them with water each morning for one month to see what would grow, knowing that some seeds stay dormant in the desert for several years waiting for enough water. Everyday I would walk out to water them and sometimes have a hard time finding them. After about one week I noticed I was beginning to track up the desert and it began to bother me. I decided to take the path so I would not interfere. I still would get lost from time to time until the path got evident enough and I got continually deliberate enough. Then I realized that my success there would be in the clarity with which I did that and not in what I planned." One more thing: it has a supremely creepy sculpture by Mark Dion, pictured below. 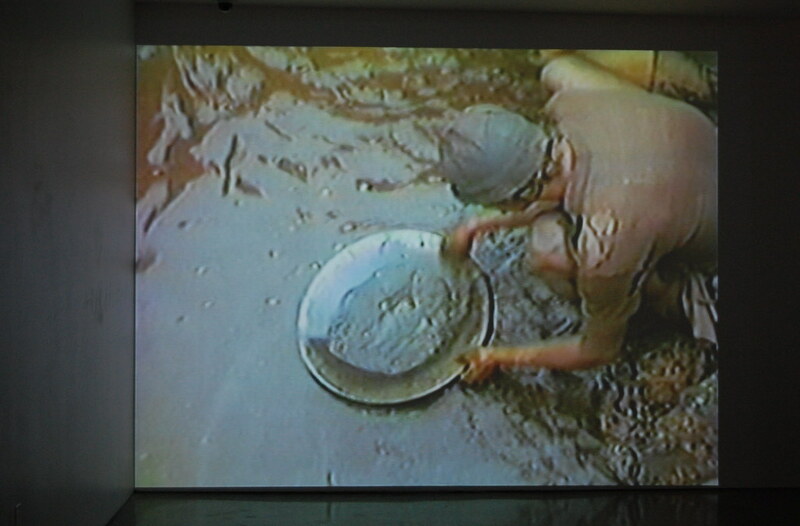 Detail of Mark Dion, Killers Killed, 1994–2007. 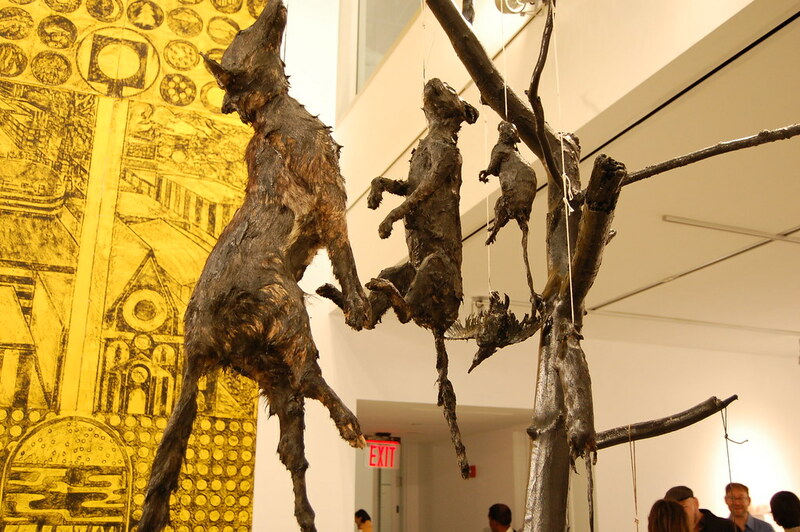 Tree, taxidermy animals, tar, galvanized aluminum foam, paint. Matt Mullican, Untitled, 1990. Oil stick rubbing on painted paper. Alfredo Jaar, Introduction to a Distant World, 1985. Digital video, color, sound, 9 min., 30 sec. 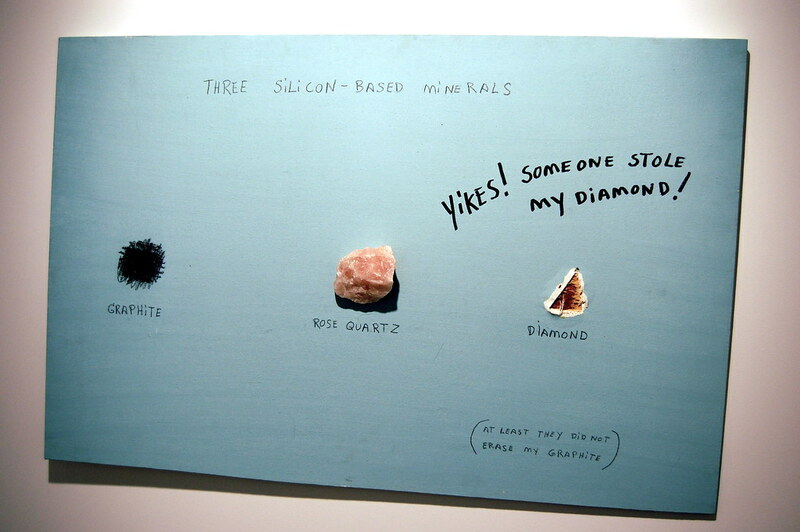 Jimmie Durham, Someone Stole My Diamond, 1998. Stone and text on painted wood. 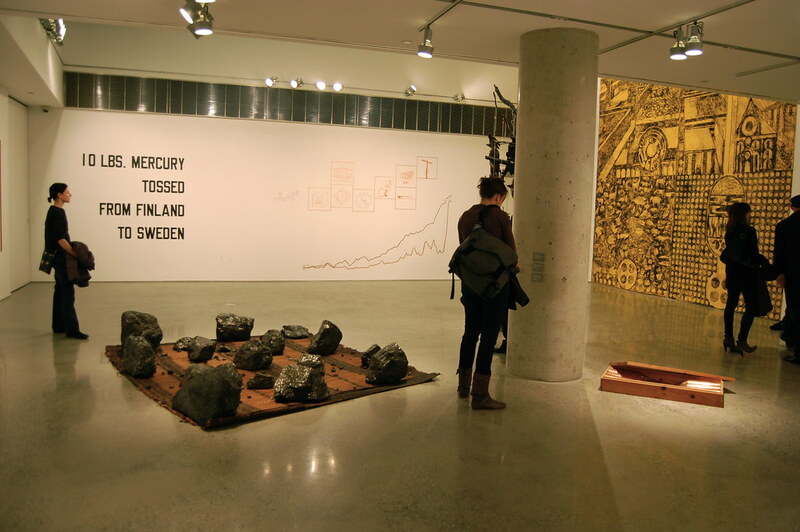 Installation view of "The Crude and the Rare." "The Crude and the Rare"